Heidi Telstad has been riding horses since she was a little girl – but now the Langley lawyer is preparing for her biggest equestrian challenge yet. She’s the only Canadian riding in this year’s Mongol Derby. Spanning over 1,000 kilometres, it roughly tracks the postal route created by Chinggis Khaan in the 13th century. It’s often called the longest and toughest horse race in the world, and this year only 44 of the 1000 applicants were chosen to compete in the race, which covers both desert and rocky terrain through the Mongolian wilderness. “The biggest danger is the wild dogs and they say you won’t see them coming,” said Telstad. Nouf Abdul Reda, astride 11-year-old Anglo Arabia gelding RR Erebus, landed the 100km Shaikha Fatma bint Mansour bin Zayed Al Nahyan Ladies Endurance Cup for Al Maghaweer Stables, at the Emirates International Endurance Village in Al Wathba, Abu Dhabi on Friday. Shaikha Mahra bint Mohammed bin Rashid Al Maktoum headed the 108 riders who started the race under favourable weather conditions at the beautiful venue which was decked up with a lot of side activities at the 'Arts Creative Land' for young kids and especially girls. The race was attended by Shaikha Fatma bint Mansour bin Zayed Al Nahyan and accompanied by her two brothers Shaikh Mohammed bin Mansour bin Zayed Al Nahyan and Shaikh Hamdan bin Mansour bin Zayed Al Nahyan. “Strong” new measures applied in the UAE from 13 February failed to reduce speeds in the first two endurance rides to apply them. The Gamilati Cup for mares on 18 February, and a juniors’ race the next day both recorded some of the fastest aggregate speeds over 120km this season. Well, as an American endurance chum put it, that was as useful as a bucket of warm spit. I don’t know a single sceptic who wouldn’t have been ecstatic to be proved wrong about the efficacy of the “strong new measures” put in place on February 13th for the remainder of the UAE winter season. There has been no dancing for joy this week among the “clean” endurance community, though. The FEI’s stated aim is to reduce the speeds associated with catastrophic injury. But at the first two rides last week under the “new” constraints, some of the fastest aggregate speeds of any national or FEI 120km ride this season were recorded, with completion rates as dire as ever. Endurance is about training horses for recovery, and thus a mystery to most other horse disciplines. I have only recently grasped enough of it to appreciate why the correlation is so fascinating and absorbing to those who love classic endurance. But in the UAE, it’s taken to extremes. They can afford to buy the very best selectively-bred Arabian super-horses. Their agents round the world target horses who are not just fast but that can present at vet gates within minutes, a trait the UAE trainers then refine through methods the rest of us can only imagine. In Bouthieb, there are no more dead horses during the competitions or horses put down due to redhibitory fractures. In Bouthieb, the speed is not the main obsession at the expense of the horses. In Bouthieb, we obtain a rate of no-treatments that would make many organizers, many federations around the world green with envy. In Bouthieb, ensuring above all the welfare of the horses is about to become again commonplace. In Bouthieb, the horse has left the status of a tool to become a partner with whom we play. Bouthieb is the rebirth place by means of the establishment of a concrete way of doing based on obvious facts, all this being made possible by the courage and determination of a prince who is not afraid to upset the world in order to "simply" return to the fundamentals of endurance. Is it so hard to do the same somewhere else? Every year, the National Federation of the UAE publishes the calendar of the season which will be amended if necessary as the weeks go by. It is the result of negotiations between the three organizing committees and the federation. The resulting official calendar is made in such a way that the distribution of the rides is balanced equally. There are 22 competitions in each of the three venues for the 2015/2016 season, totaling 66 for the country (January 1st 2016 edition). Bouthieb alone represents 33% of the UAE competitions for the current season. So it is not a minor venue. We could even add that the "qualifiers" being more numerous, the number of horses that pass through Bouthieb make it the most important venue. A more detailed study would probably show that for an average year this site has between 40 and 45% of the overall number of horses in competition. Then we must stop focusing on Dubai and Al Wathba thinking that Bouthieb represents a small thing in a corner of the UAE. Yet this is what surfaces in the news we can read here and there over the world. It must be said that many articles are written from far away, and everyone knows that the longest the distance is, the more schematic, the more generalized the result is. And as sensationalism does not come from what is positive but almost always from what is negative, one darkens the picture, stigmatizes easily, turns over and over because of his resentment and forgets what is right and good, though it is necessarily where the future lies. wo days ago, the FEI wrested its latest second/third/fourth-chance agreement from the UAE over the breaking of endurance rules and the breaking of horses. There is no black and white solution. After 20 years of doing exactly what they want, the UAE was never going to roll over in a matter of months. At first glance, the Emirates federation (EEF) is still bluffing the FEI. The “new” measures agreed on February 13 for the rest of the winter season are a partial re-hash of extant rules that the UAE has cheerfully flouted for years. But the UAE still hasn’t been quite brave enough to walk away and start its own desert racing governing body (I use the word “governing” loosely.) We can assume they want to stay in the FEI, and so I hope stripping Dubai of the 2016 world championship event remains a live threat that can yet have an effect. It’s summer in the southern hemisphere – the season for sand and sandals. In horse sport, it seems to be the season for sand and scandals. Yes, we’re living the dream. Or is it a nighmare? Followers of horse sport will be well aware of the endurance troubles in the United Arab Emirates (UAE) that hit the headlines this past month. We now have a new deal and, who knows, maybe the dust will finally settle around UAE endurance and the FEI can return to happy families. It is now a matter of waiting to see if the new measures will make any significant difference, which provides a nice window to look at the issue of reputational damage to horse sport. Shaikh Rashid and Madhu Singh were involved in a two-way battle for supremacy and the UAE rider came up on top to win. Riding 12-year-old grey Shaddad, Shaikh Rashid Dalmook Juma Al Maktoum edged out Indian rider Madhu Singh on Mustafa to win the prestigious 160-km HH The President of the UAE Endurance Cup at the Emirates International Endurance Village in Al Wathba on Saturday. The FEI, as part of its continued efforts to ensure strong measures for Endurance in the UAE are taken, has today held talks with the Emirates Equestrian Federation (EEF) in Abu Dhabi (UAE). FEI Endurance Director Manuel Bandeira de Mello met with EEF Vice President Mohammad Alkamali, EEF Secretary General Taleb Dhaher Al Mheiri and EEF Executive Board Member Faisal Al Ali to work through the exact measures that will be implemented at international (CEIs) and national (CENs) Endurance events in the UAE for the remainder of the current season, which runs until early April. These talks follow recent meetings between the FEI and the EEF in both Switzerland and the UAE, after which the EEF postponed four Endurance events so that agreement could be reached on proposed measures to urgently address a number of serious issues in Endurance in the region. The CEI1* in Dubai on 8 February was postponed, along with national events on 4, 5 and 6 February. In addition, the EEF took further action, suspending five riders and five trainers for a six-month period and imposed fines following what they termed “gross offences” at the national junior and young rider 120km ride at Al Wathba, Abu Dhabi, on 30 January. The FEI had set the deadline of 11 February for the EEF to come back with an agreement on the proposed measures, with the caveat that no further events would be held in the region until agreement on these measures had been reached. The CEI 3* 160km HH The President of UAE Endurance Cup, attended by Mr De Mello, took place today in Al Wathba, following agreement with the FEI on the measures. The event, held at the Emirates International Endurance Village, was well organised with the winning combination averaging a speed of 26.3 kph and all horses crossing the line in good health. 2. Limit the number of horse and rider combinations entered into each international and national event to 150. 3. Heart rate presentation times reduced to between 56 and 60 bpm for all loops in one-star competitions, and in the final loop for two- and three-star CEIs and CENs. 6. The last 2-5 kms of the final loop will be designated and controlled so that no cars or crews can access. 7. In the final loop, crewing in the form of offering cooling water bottles will only be allowed at designated crewing points every 2-5 kms - no other crewing will be allowed. 8. In all CEI 3* and CEI 4* events, all horses will be confined in Secure Overnight Stabling, in accordance with FEI Regulations. 9. The Official TV Broadcasters have been named; as such the film/video recordings are the official record of the event and hence legal actions may be taken against the violators of any regulation viewed on this footage. 10. Crews will be identified with numbered bibs that match the number of the horse to enable easy identification; should a horse be eliminated from the competition, the bibs will be surrendered immediately; only those people with a numbered bib matching that of the horse still in competition will be allowed to crew or to accompany the horse at any time during the event. 11. A ride briefing will be held at each event to review regulations, and to update everyone involved of any changes in regulations for the event; attendance will be compulsory; failure to attend shall result in immediate elimination from the event. 12. All officials will now be appointed by the EEF instead of Organising Committees; no non-EEF appointed officials will be able to officiate at international and national events. “We need to change hearts as well as minds, and the solution lies in education and dialogue, as well as taking a tough line with sanctions,” explained FEI Secretary General Sabrina Ibáñez. “The Emirates Equestrian Federation has been bold, taking stringent action as seen recently with the suspension of events and sanctioning athletes and trainers, clearly demonstrating their commitment to work together with the FEI to eradicate the incidents that have tarnished the sport. We will continue to work together to ensure progress. “Protecting horses comes first and we are determined that this specific value is upheld at international and national level Endurance competitions. While the FEI does not have jurisdiction over national events, we will continue to do our utmost to ensure that changes at an international level are also felt nationally. “It is clear for everyone what is at stake, and the FEI is working closely with the EEF to make sure that any challenges to run the sport within the FEI’s clearly mapped rules are overcome, and that everyone in the sport understands the importance of standing by the measures implemented for the rest of the season. Equestrian Australia (EA) continues to advocate for an end to the horse welfare issues occurring in endurance internationally. EA has maintained regular dialogue with the FEI regarding this matter and has been assured by the FEI in a letter to national federations this week that action is being taken. EA will continue to lobby the FEI to ensure that horse welfare remains a paramount consideration of all national federations and their equestrian events, regardless of discipline or classification. The Chair of the FEI Endurance Committee, Australian Veterinarian, Dr Brian Sheahan, is addressing the EA endurance committee Thursday evening (11 February) regarding the progress of horse welfare issues in the United Arab Emirates. Today, endurance racing resumes in the United Arab Emirates, with 10 four-wheel-drives up for grabs in a 160km contest at Al Wathba, in Abu Dhabi. It all seems rather hasty. The Emirates Equestrian Federation (EEF) has forwarded its list of proposed changes, and the FEI seems happy enough at this stage. It will be a busy day. On a day when one of biggest rides of the season in the United Arab Emirates unfolds, its endurance people will be meeting with FEI officials to finalise the exact details of the measures. Abu Dhabi Over 125 top riders and 25 overseas horses will vie for honours in the HH The President of the UAE Endurance Cup which will be run over the championship distance of 160-kms at the Emirates International Endurance Village in Al Wathba on Saturday. “Besides the hosts. riders from Saudi Arabia, Bahrain, Spain, France, Belgium, Netherlands, Slovakia, Portugal, Finland, Sweden, Norway, Australia, USA and UK will battle for honours,” said Adnan Sultan, Director General of the Abu Dhabi Equestrian Club. “The winner of this FEI Three-star ride will drive away with a Mercedes-Benz 4WD while the second-placed rider will win a Range Rover Sport 4WD. The eight other riders in the top ten will all be awarded a Nissan Patrol 4WD each making it ten cars for this event alone. “Apart from this, Dh60,000 will be distributed to all those who complete the 160-km ride,” he added. Endurance rides in the UAE have been allowed to resume in time for the prestigious 160km President’s Cup tomorrow (Saturday, 13 February), on th condition that new measures are applied that bear close resemblance to the “Bou Thib initiative”. Sport was halted last week after a further escalation of horse welfare issues. The Emirates Equestrian Federation (EEF) was given until Thursday 11 February to propose new controls and gain agreement from the FEI. At least five trainers who were overseeing the horses and riders have been banned, while the grooms of the five horses had forfeited their licences. The Emirates Equestrian Federation (EEF) has announced the lifting of the temporary ban on endurance rides in the UAE starting today. Mohammed Al Kamali, Chairman of the Executive Board of the EEF reiterated that the executive board has taken stock of the situation and found the conditions favourable to re-start the endurance rides with immediate effect. Last week, the EEF had handed out a temporary ban valid till Feb.11 on all activities related to horse endurance based on short-comings noted during the UAE Youth Endurance Ride (120 kms) held on Jan. 30. As many as 55 horses had participated in this ride, and five riders and their mounts were eliminated after some offences had been discovered. At least five trainers who were overseeing the horses and riders have been banned, while the grooms of the five horses had forfeited their licences. Each of the five stables involved in the violations had also been slapped with fines of $100,000 (Dhs 365,000) each. UAE: The Bouthieb initiative: The new way ahead for endurance? Endurance is again embroiled in controversy, with welfare concerns in the United Arab Emirates again taking centre-stage. One of its venues, Bouthieb, has taken a different approach, with rules designed to safeguard horse welfare. It has been stunningly successful. Four-star endurance judge François Kerboul, who was involved in setting up the Bouthieb initiative, explains how it works, and provides some insights into UAE endurance. 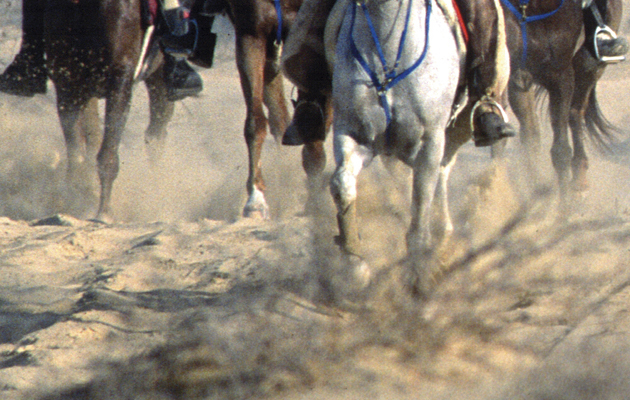 Endurance competitions at Bouthieb essentially ensure that speed is not the main obsession at the expense of the horse. Its rules, in which speeds are GPS-monitored and the majority of prize-money is allocated to the best-conditioned horses, have resulted in remarkably few horses requring veterinary treatment, and even then for only minor issues. Bouthieb’s rules were made possible by the determination of the venue’s owner, Sheikh Sultan bin Zayed Al Nahyan, who was not afraid to return to the fundamentals of endurance. An online petition demanding the FEI removes the December 2016 world endurance championship from Dubai reached 4,000 signatures over night (Tuesday 9 – Wednesday 10 February). It has also attracted high-profile support from outside endurance, with British Olympic rider Jennie Loriston-Clarke among signatories from all over the world. The petition was launched by the continental-based “clean endurance” community last Friday afternoon (5 February). The group says it will advise FEI president Ingmar de Vos of the interim results before the FEI meets the Emirates Equestrian Federation tomorrow (11 February) to discuss solutions to the latest welfare scandals that brought UAE endurance to a halt on 4 February. Following further incidents during the endurance season in Group VII of the FEI in the Middle East, the Swiss Equestrian Federation (SEF) is strongly opposed to the intended venue for the Elite Endurance World Championships in December 2016, namely Dubai (UAE). Since the beginning of the season in October 2015, 10 Catastrophic Injuries have been reported to the FEI, with seven horses confirmed dead. Omani riders claimed the team bronze at the GCC Women's Endurance Cup in Doha, Qatar on Friday. The International Equestrian Federation is under pressure to strip Sheikh Mohammed’s Dubai International Endurance City of the 2016 world championship event, as the horse welfare crisis in the United Arab Emirates sport escalates. The FEI and Emirates Equestrian Federation halted all UAE long-­istance race-rides last Wednesday until at least Feb 11 while further solutions were sought. The flogging of five exhausted horses by riders and their grooms during in a 120-kilometre youth ride at Al Wathba, Abu Dhabi on Jan 30 was witnessed by thousands of horrified viewers on the event’s live-stream. 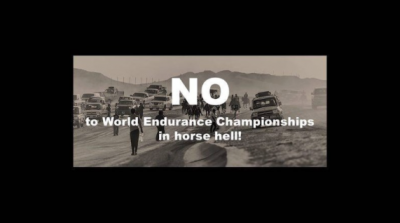 Now, the American Endurance Ride Conference – pioneers of the “classic” sport since 1972 – is demanding that the FEI relocate the 2016 world title event, and imposes a new, minimum one-year suspension on the EEF. Kuwait: Kuwait's jockey Meshari Al­Sour, of Al­Mutrega team, won the popular heritage championship for 120­kms endurance riding race for elite horses on Saturday at Sabah Al­Ahmad Heritage Village, part of the Sixth Gulf Popular Heritage Festival. The United States is unlikely to be represented at this year’s World Endurance Championships should it go ahead in the United Arab Emirates (UAE). American Endurance Ride Conference (AERC) president Michael Campbell, writing to the US Equestrian Federation (USEF) on behalf of its membership and board of directors, said it wanted the world championships to be removed from the UAE to a “more suitable location”. Apologies for this being a blog of links. There is so much information currently flying about that it’s easier to collate in one place. The EEF have cancelled all races until the 11th February 2016 as a result external pressures from the rest of the world having viewed the appalling scenes and news of abused, exhausted and vanished horses coming from the Dubai ride at the weekend. Unsurprisingly, the restrictions just stop short of the high profile President’s Cup, due to be held on the 13th of February 2016. The initial purpose of this blog is to share the petition far and wide about stopping the UAE and other Group VII countries from the ongoing extreme abuse to horses, and taking the privilege of hosting the WEC away from them. The KNHS once again in the international equestrian federation FEI expressed its concern to the FEI to take action against the recent controversial practices during endurance races in the UAE. The KNHS noted improvements in recent months, but is nevertheless shocked by the [Young Rider] race in Al Wathba, UAE. The FEI worked last year, imposing all new regulations to improve the welfare of the horses in the Middle East. In that process should, according to the KNHS, more stringent steps to be put. KNHS will support any upcoming FEI measures. If these, in the opinion of the KNHS, prove ineffective, the KNHS will take its own measures. A study to investigate the health of endurance horses in Britain has been launched by the Animal Health Trust and Endurance GB (EGB). In 2015, 1,209 horses were registered with EGB, however, no objective information is available on the general health status or specific veterinary problems of British endurance horses. The study, led by Dr Annamaria Nagy, a senior orthopaedic clinician at the AHT, was set up to “establish the prevalence of veterinary problems and to investigate whether horse, rider or management-related risk factors are associated with specific problems”. Dubai The head of the Emirates Endurance Federation (EFF) has emphasised that a zero tolerance policy in the sport will be implemented after the suspension of at least five endurance riders that has led to a temporary suspension of all endurance related activities in the UAE. Mohammad Al Kamali, Chairman of the Executive Board of the EEF and General Secretary of the UAE National Olympic Committee (UAE NOC) told Gulf News that any violation of rules and regulations laid out by the sport’s governing, the Fédération Equestre Internationale (FEI), would not be tolerated. “The safety of horses and compliance with all rules and regulations is of utmost importance to the integrity of any sport. Endurance riding is comparatively new and it is essential and crucial that we maintain its authenticity to ensure a bright and healthy future for the sport,” Al Kamali told Gulf News following a closed-door meeting of the EEF Executive Board on Wednesday. The swift action was initiated following lapses and violation of rules and regulations during the 120km UAE Youth Endurance Ride held on January 30. As many as 55 horses participated in the ride, and five riders and their horses were eliminated due to the contravention of FEI rules wherein they were deemed to have excessively whipped their horses in the final stages of the ride. On Thursday, the EEF suspended the five endurance riders and temporarily suspended all endurances rides and allied activities in the UAE till February 11. Additionally, at least five trainers who were overseeing the horses and riders have been temporarily banned, while the grooms of the five horses have forfeited their licences. Each of the five stables involved in the violations have also been handed fines of Dh100,000 each. The Executive Board also asserted that all Endurance Villages, Endurance Riding Clubs and Stables must adhere to a uniform process of registering all personnel, including service crew associated with the sport. All personnel will be issued permits which must be displayed during the course of the rides in the future. “What has happened is unfortunate, not just for the riders, the horses and the stables. But the rules and regulations are clear and as sportsmen it is the obligation of everyone involved to simply adhere to the rules,” Al Kamali said. Owing to the most recent endurance debacles in Dubai, UAE, a petition has sprung up and circulated on the internet to remove the 2016 World Endurance Championships from Dubai, and have them "staged in a country which upholds the values of Clean Endurance." The controversy involving the UAE over endurance horse welfare, cheating, horse swapping in mid-race, and more, has continued for 3 years and outraged people from around the world. FEI suspended the UAE at the end of last year's endurance racing season, warning them to clean up the abuses. UAE was reinstated at the beginning of this year's racing season, yet the abuses and horse deaths continue, with the latest debacle coming from the finish of a Junior/Young Rider Endurance Cup where 3 of the first finishers were disqualified for overriding and beating their exhausted horses, and grooms ran onto the track to haze them. All was caught on the live video stream of the race. The FEI has taken rather quick action to suspend races in the UAE for the next few days, but it is not enough action for the endurance world outside Group VII, since this same action last season proved to have little effect in ultimately protecting horse welfare in endurance races in Dubai. This petition, started by Clean Endurance, targets the World Endurance Championship in Dubai in December 2016. "The 2016 World Endurance Championships have been awarded to Dubai despite the fact that horses continue to suffer or die at every endurance competition there. Despite the UAE's previous suspension for abuse and cheating, horse welfare has not been improved. Please sign if you agree the World Endurance Championships, scheduled for December 2016, should be removed from Dubai and staged in a country which upholds the values of Clean Endurance." On behalf of the American Endurance Ride Conference (AERC) membership and Board of Directors, I am writing to request that the United States Equestrian Federation register the outrage of the endurance community in the United States over the appalling mistreatment of horses at the Al Wathba endurance ride in the United Arab Emirates (UAE) last weekend, January 30, 2016. Evidence of this equine abuse has been widely circulated on social media around the world. The suspension imposed on UAE by FEI last year has not made a lasting impression on most of the venues in the UAE, with the exception of Dr. Sheik Sultan in Bouthieb. As the endurance affiliate in the U.S., AERC requests that USEF register strenuous objections with FEI regarding the overriding and equine abuse that continues in UAE. This continued abuse is a blight on the sport of endurance riding throughout the world. 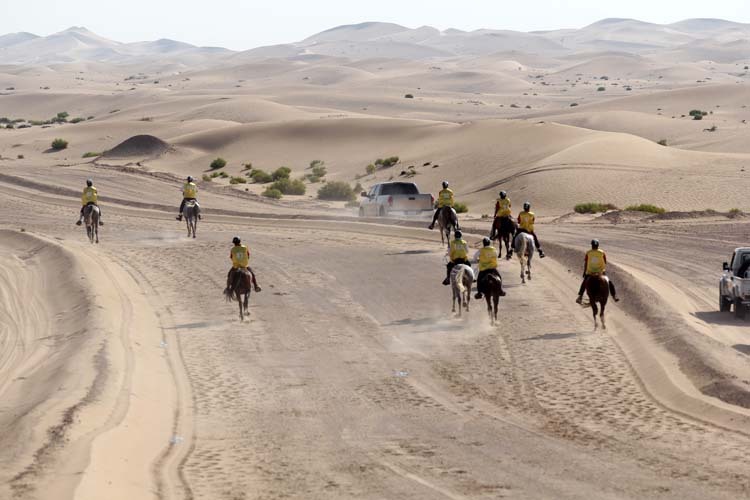 The desert style racing of UAE is not endurance riding as most other countries define it. I know that endurance communities in many other countries are expressing the same feelings to their national governing bodies. AERC further requests that stricter sanctions be imposed on UAE to drive home the lesson that mistreatment of horses in endurance rides is intolerable to the United States and the rest of the endurance world. At this point, a one year suspension would be reasonable. Finally, AERC requests that the venue for the World Endurance Championship be removed from the UAE to a more suitable location. Should FEI resist moving the venue, AERC requests that USEF forego plans to send an endurance team to the WEC. The board which oversees endurance in Britain has voiced its concerns over the controversy unfolding in the United Arab Emirates, saying the FEI has a duty to address a culture of riding horses beyond their means in the discipline. The board, in a post on the endurancegb.co.uk website, said it had been closely following the progress of the FEI in improving horse welfare in the UAE under an agreement between the world governing body and the Emirates Equestrian Federation. Emirates Equestrian Federation told it has until February 11 to explain how it will solve its “serious issues"
Endurance racing in the UAE has again been brought to a halt as the International Equestrian Federation (FEI) tries to wrest further undertakings about horse protection from the Emirates Equestrian Federation (EEF). Four upcoming race-rides were notified to EEF members as “postponed” on Tuesday night, with no reason initially offered. However FEI endurance director Manuel Bandeira de Mello flew into Abu Dhabi for an emergency meeting on Wednesday. He later told Telegraph Sport the EEF has until February 11 to explain how it will solve its “serious issues.” Until then, rides are called off, including three at Sheikh Mohammed’s venue, Dubai International Endurance City (DIEC). Last March, the UAE was suspended for four months, after a catalogue of doping scandals and horse fatalities. Endurance horses race over 80km-160km in a single day – though in the desert sport, many of them under jobbing jockeys who have never seen their mounts before, and over punishing, fast sand tracks. The Board has been closely following with interest the progress of the FEI in improving horse welfare in the UAE, in accordance with the agreement put in place with the EEF (Emirates Equestrian Federation). Whilst there have been reports of numerous improvements, especially at the Bou Thib venue, we are deeply concerned and shocked by the video that has emerged from a CEN event at Al Wathba on the 30th of January. We have today written to the BEF [British Equestrian Foundation] to share our concerns and have asked that they are passed to the FEI. We have requested that further action be taken and that this is made public as soon as possible. The FEI have a duty to address a culture of riding horses beyond their means in the sport of endurance. The Board fully support the FEI to intervene and implement new measures that protect horses and the sport worldwide. The FEI has given the United Arab Emirates (UAE) until February 11 to come up with an agreement that will remedy what the world governing body calls serious issues in endurance in the region. The FEI issued a statement early today from its endurance director, Manuel Bandeira de Mello, who is understood to be in the UAE. It said the Emirates Equestrian Federation (EEF) had postponed four endurance events in coming days “so that agreement can be reached on proposed measures to urgently address a number of serious issues in endurance in the region”. The EEF’s calendar shows it has also postponed a fifth ride, a 100km ride restricted to private stables and individuals, set to be run in Dubai. The four postponed events are the Rashidiyya Ladies Cup, which was to be run today; the Jumairah Endurance Cup for private owners, set for tomorrow; the Emirates Championship, scheduled for February 6; and the AlBarsha CEI 1* endurance ride on February 8. The next five endurance rides on the Emirates Equestrian Federation’s calendar have been postponed. The development comes amid ongoing controversy in the sport in the United Arab Emirates (UAE). Two rides set down for February 4 have have been postponed in Dubai – one a 100km ride restriced to private stables and individuals; the other a CEI 1-star event over 80km. A CEN 100km ride for women set down for February 5, also in Dubai, has similarly been postponed. A CEN 120km ride at Al Wathba on February 6 and a CEI 1-star over 80km in Dubai on February 8 round out the list. The reasons for the postponements have not been posted on the Emirates federation’s website – or at least not in the English version. The news comes amid reports that the FEI’s endurance director, Manuel Bandeira de Mello, has arrived in Abu Dhabi as the world governing body pushes for endurance reforms in the UAE. The FEI is hoping that the UAE will adopt rules similar to those adopted at Sheikh Sultan Al Nahyan’s endurance facility at Bouthieb in Abu Dhabi. Normally, when my colleague calls me over to her computer to watch a video, it’s going to show a fluffy kitten doing something insanely cute, a horse unlatching his stable door, or a dog proving that he’s smarter than his master. But yesterday I was instead subjected to 7 minutes and 53 seconds of endurance from the United Arab Emirates. More specifically, the Sheikh Zayed Bin Mansoor Al Nahyan Junior & Young Riders Endurance Cup, raced over 120 kilometres on Saturday at the Emirates International Endurance Village in Al Wathba, Abu Dhabi. I wrote about this particular race the day after the event, having read the results. The results, I felt, spoke for themselves in terms of the issues with UAE endurance. There were 55 starters, only 18 of whom successfully completed the four-loop race. Of the 37 eliminations, 19 were recorded as going out because of an irregular gait (including one before the race even started); another because of an irregular gait and metabolic issues; three were listed as failing to complete; five were retired by the rider; one was disqualified for departing 10 minutes early; one was listed as being out of time; and six were disqualified for beating their horse. A horse named Ainhoa Catharissime, a grey Arab mare, went out on loop three after suffering a catastrophic injury. 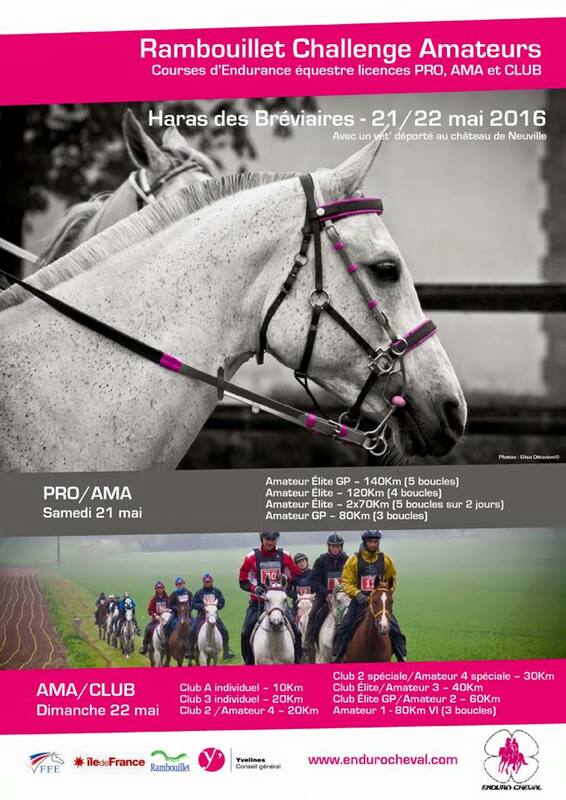 The Rambouillet Challenge Amateurs will take place May 21 and 22, 2016, at Chateau de Neuville. Taking the place of the Raid Yvelines this year, Rambouillet Challenge Amateurs is an event for licensed amateurs and club, and the course will use some of the trails of Raid Yvelines. Ten races are scheduled on Saturday and Sunday. In the programme of amateurs: Cen *** (140 km), Cen ** (120 km), Cen ** (2 x70km on two days), Cen * (80 km). In the programme of clubs: Elite GP (60 km), Elite (40 m), Club 2 Special (30 km), Club 2 (20 km), Club 3 (20 km), Club 4 (10 km). Opening date for entries will be announced soon. In the video in this article, it shows the end of the 120 km Endurance ‘competition’ at Al Wathba in Dubai. FIVE riders were disqualified for beating horses. One rider/crew wasn’t reported in time for beating his horse, so wasn’t disqualified. There is no further punishment. This is difficult viewing, but it must be seen. One horse is reported as having sustained a CI (catastrophic injury) the end result for which should necessarily be euthanasia. Several horses just ‘vanished’ mid ride. No vet saw them, they didn’t return to the gates. Here are some stills from the video – all these people chasing individual horses that are so tired they are close to collapse. Imagine if this happened in eventing or racing in the UK? Or even anywhere else in Europe. The ariel view has ONE horse in it. ONE. The FEI have to act – how can they entertain the Endurance World Championships being held in Dubai with these levels of abuse, never mind the blatant rule breaking that is going on? Below is a take on why this is happening, from Rachel Marty, a Dutch Endurance rider. Although a fascinating read, it doesn’t offer much hope for the horses in the Group VII countries. A huge thanks to Rachel for taking the time to write this. 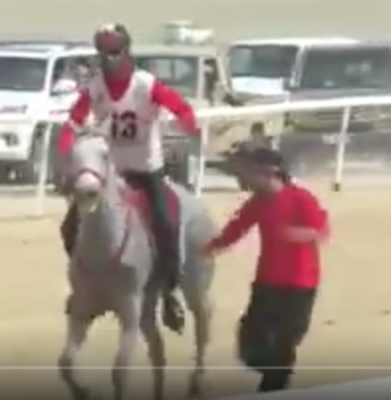 This video shows exactly what the problem is with UAE endurance: the horse is solely seen as a means to an end. A machine carrying riders/trainers/owners to a desirable result. A thing that is used until it breaks. Nobody of the visible spectators seems to care about the fate of these animals. There is a mass of people that simply chooses to ignore that these horses are simply too tired to go on. Mass of people that even participates to their destruction. I am sorry, folks, to write about endurance three blogs in a row, but I cannot deny my rising anger at the FEI’s abject failure to get a grip of the UAE. But elsewhere, the catalogue of rule-breaking, land-speed record attempts, knackered horses and brutal harassment (“hazing”) of horses by hooligans in four-wheel drives with no business to be on the piste, is worse than last season and all caught on camera by the official live stream, YAS. I am utterly bewildered why a renewal of the UAE suspension has not already been applied. By the way, the 10th Catastrophic Injury of the current UAE season was recorded at this same ride, another landmark moment – not. We have been hastily advised that some CIs listed since October are mistakes and downgraded to Irregular Gait (IG). Is that all right then? Not really, as it says rather a lot about the competence of a vet who can’t spot the difference between a snapped cannon bone poking through the skin and a bit of unlevelness. But this is not what has upset me most this weekend. Of course I am distressed about the latest CI, though if Ainhoa Catharissme really is dead then at least her miserable existence is over and she has found peace in horse heaven, where she has, no doubt, already hooked up with old chums from the barn.